This is a recipe that will leave with a satisfied feeling in your stomach. 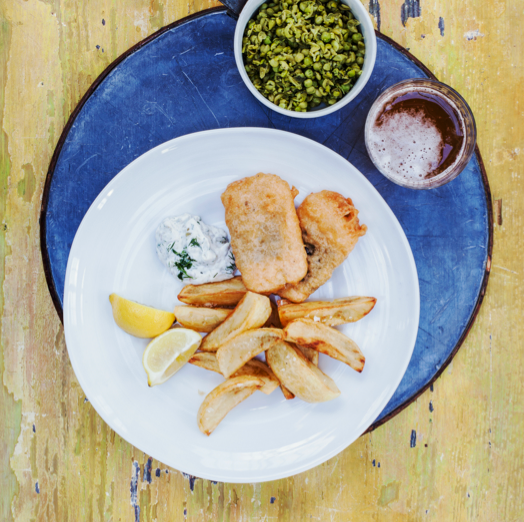 If you're vegetarian but still crave that British classic then look no further than this recipe for Beer battered Tofu 'Fish and Chips with Tartare Sauce and Mushy Peas courtesy of Whole Food Heaven. If the beer battered part didn't tempt you in already then I don't know what will as this recipe is packed full of flavour and even if you're not veggie, it's great to try something different. Get the latest from Whole Food Heaven by following them on Twitter and check out the rest of our Men Make Dinner Day recipes here. We’re suckers for anything battered once in awhile and this really hits the spot. The tofu is a wonderful substitute in this classic British dish and the nori really adds the taste of the sea. Served with chunky chips, piquant tartare sauce to liven it up and a healthy dose of mushy peas, this is a dish to treasure. Serve, of course, with cheap malt vinegar. To make the chips, heat the oil to about 160 ̊C. When a cube of bread browns in about 40 seconds, put half the chips in – you’re going to cook them in two batches – and fry for about 10 minutes until the insides are soft. Keep the temperature constant. Remove with a slotted spoon and leave to drain on a baking sheet covered with kitchen paper (paper towels). While the chips are draining, make the beer batter by combining the flour, cornflour, onion, garlic and chilli powders with the ale, mixing thoroughly. In a pan, heat the oil to 170 ̊C. Check the temperature by putting a couple of drops of batter in the oil and seeing if it crisps up. When you’re ready to eat, heat the oil to 190 ̊C, put the chips back in and cook until they’re golden and crispy. This should take about 6 minutes. Meanwhile, put the peas in boiling water with a little salt, bring to the boil, then cook for a couple of minutes until they’re slightly overdone. Strain, put them back in the pan, then crush with a potato masher, adding a little water if necessary to make them soft. Add the apple cider vinegar and chopped mint. Season with salt and pepper and slowly heat while mixing for a couple of minutes. Put everything together on a (big!) plate with a generous wedge of lemon and a dollop of Tartare Sauce and enjoy.